Whether you are exercising for ambition, for health or simply for fun, it should be rewarding. Stop tormenting yourself. 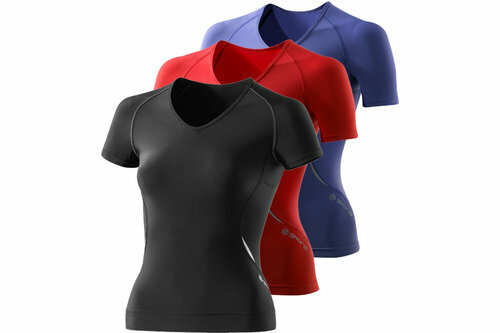 SKINS A400 womens short sleeve tops with v neck enhance your performance naturally. Dynamic gradient compression accelerates your blood flow to deliver more oxygen to your active muscles and biomechanically placed Memory MX fabric provides constant, controlled compression and unrestricted movement - giving you have that secret edge over the competition. SKINS A400 are tailored based on 400 key fitting points derived from full 3D body scans of hundreds of active women of all shapes and sizes, so the top wont ride up to your armpits. 400 fit coupled with dynamic gradient compression helps to improve core body control and power, and reduce post-exercise muscle soreness. Now youve got yourself a top that is comfortable, helps regulate body temperature and mproves your performance like nothing before. 400fit - A super comfortable fit, more precise, targeted Dynamic Gradient Compression and a greater range of different body shapes for women. Memory MX Fabric - Memory MX fabric contains a unique high stretch elastomeric yarn, which returns to its original shape no matter how much stress you put it under. Moisture Management - Keeping you dry through advanced wicking is inherent in all SKINS fabrics - moisture is drawn away from your skin, so you stay dry and comfortable. Muscle Focus - Uniquely wrapping and supporting your key muscle groups to reduce movement and focus direction for less vibration in your muscles, less soft tissue damage and less soreness after exercise. Odour, Stink, Pong, Smell, Stench Free - Permanent antimicrobial treatment discourages bacteria by ionically absorbing the odour causing substances normally associated with Lycra wear. These features are built into all our fabrics, so they cant ever be washed out. Warp Knit - The fabric in SKINS is warp knitted using multiple fine quality yarns to give superior performance. Warp knit fabrics have no natural stretch instead, the spandex mix ensures specific levels of elasticity and perfectly controlled compression.